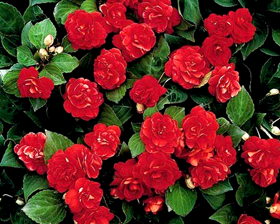 The best fully double-flowered impatiens from seed. Masses of miniature rose-like flowers in bright orange color. Sow from February to May at 20-30C on the surface of a good seed compost and cover with a very fine sprinkling of compost or Sow-Lite (vermiculite). Ensure the soil is damp but not wet and seal inside a polythene bag until after germination, usually 14-21 days.